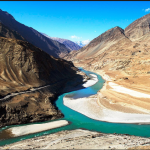 Himalayan Rivers of India, the article provides a brief description about them. These rivers in Himalaya are very long. These Himalayas rivers are perennial because they derive their water from snowmelt and rainfall. But, the seasonal variation of the water-flow is a typical feature of this Himalayan river system. Many important rivers had their origin in the Himalayas. The Himalayan rivers provide a new dimension to the scenic beauty of Himalayan region. In those areas, the Himalayan river system is the major source of life. These Himalayas rivers enable the formation of irrigation process and forest belt in those regions. Let us learn about the Himalayan river systems in detail. The himalayan rivers contain 3 systems. This himalayan river system consists of the river Indus and the 5 tributaries of this river – Sutlej, Beas, Ravi, Jhelum and Chenab. Near the Mansarovar lake, the Indus originates in Tibet at a height of 5,180 metres and enters the territory of India in jammu and Kashmir.